8 Antidotes to the Stupidity of "Shark Week"
This year, Discovery Channel promises Shark Week will feature fewer fake documentaries and more actual science. But with shows like “Return of the Great White Serial Killer” on the docket, it’s clear Discovery still has a lot to learn. For critically minded viewers, here are eight alternatives to those episodes of Shark Week still tainted by pseudoscience and fear-mongering. Every year, the Discovery Channel spends a week reminding us how frightening sharks around the world can be. It’s a week of half-truths, embellishment, and occasional outright fabrication. But man, it’s good TV. But what about all the animals that aren’t sharks? Don’t they want to kill us too? In fact, yes, they do. Pretty much all of them. And thanks to the hard working journalists at LWON, you will learn about five such frightening creatures this week. Are they genuinely dangerous? Sure, why not? Are they interesting? Absolutely. Are they terrifying? Well, they are now. The first animal on this week’s docket? The duck-billed platypus—an ostensibly adorable creature with a deadly secret. (It’s poison. The secret is poison.) See also previous years’ Snark Week entries. Each installment in the four-part series, which originally ran in 2012, focuses on a cow-related death, and includes “information about the bigger picture” plus tons of links to helpful resources, like Popular Mechanics’ cow attack survival guide. Deep-sea biologist Andrew David Thaler calls JacquesWeek “an alternative to Shark Week for those who either don’t get the Discovery Channel or just want something different.” The gist is simple: Every night this week, Thaler will be watching 2-3 classic documentaries featuring legendary ocean explorer Jacques Cousteau, and leading live discussions on Twitter with the hashtag #JacquesWeek. I’ll be honest, I’m burned out on Shark Week. After several years of intense livetweeting, post-show debunking, and high-level critique... I find that I just don’t have much more to say. Some shows will be good. Some shows will be great. Some shows will be bad. Jacques Cousteau has never let me down. Sure, sometimes the science is off (pretty much everything in Blind Prophets of Easter Island is incorrect, for example), but that’s because the Calypso crew was working at the boundaries of human knowledge, and their work comes off earnest, heartfelt, and compassionate. And so full of wonder. Much of what Cousteau’s team did was done for the very first time. In this 2012 episode of the outstanding science series Inside Nature’s Giants, veterinary surgeon Mark Evans and a team of experts travel to South Africa to dissect a 15-foot-long great white shark. Excepting the ominous soundtrack and dramatic introductory voiceover, the short documentary provides a rare and intimate look at the anatomy, behavior, and evolution of this powerful ocean predator. There’s more to shark week than great white sharks! There are upwards of 400 different species of sharks (meet some of them here, in this excellent episode of The Brain Scoop), and even more if you include rays, skates, and sawfish, to which sharks are closely related. All of these animals belong to the subclass of cartilaginous fishes known as elasmobranchs. The video above features an impromptu dissection of a Raja binoculata, the world’s largest species of skate, which marine biologist Chris Harvey-Clark refers to as a “stepped-on shark,” for reasons that should be obvious. Elasmobranchs are delightfully weird animals, not just physiologically—did you notice that the skate in the video above has reversible jaws?—but genetically. In 2011, researchers discovered that members of elsmobranchii are the only known jawed vertebrates on Earth that are missing a portion of their genome known as the HoxC gene cluster—a hugely important section of genetic code that was once thought to be indispensable. 3) What if There Were No Sharks? Joe Hanson of It’s Okay to be Smart looks at what could happen if the hundreds of species of shark were to vanish from the world’s waters. A good mix of ecology and conservation science. Jonathan Bird’s Blue World is a fantastic marine biology documentary series created by PBS and YouTube. The channel features more than 20 fascinating episodes on sharks and shark biology. Really, really good stuff. David Shiffman is a marine biologist and science educator who studies shark ecology and conservation. You may have seen him on Twitter under the handle @WhySharksMatter, on the marine biology blog Southern Fried Science, or here on io9, advocating for sharks and addressing their misrepresentation in the media. For the past four years, Shiffman has used Twitter as a platform to fact-check and comment on Shark Week episodes as they air, and his criticisms of Shark Week (which he recently condensed into a cogent post for Vox), have been instrumental in convincing Discovery Channel to spend more of its yearly series focused on science and conservation instead of pseudoscience and fear. He even kicked off this year’s series with a helpful list of ways to tell if Shark Week has really improved. It’s no surprise, then, that Shiffman has become a sort of unofficial ombudsman to Shark Week. This year, in addition to his long list of other contributions, Shiffman is doing deep dives on individual Shark Week episodes on Scientific American and Facebook. Follow him on Twitter, where you can ask him questions about sharks that stand a good chance of being answered. While you’re at it, check out his list of recommended shark experts. Contact the author at rtgonzalez@io9.com and @rtg0nzalez. 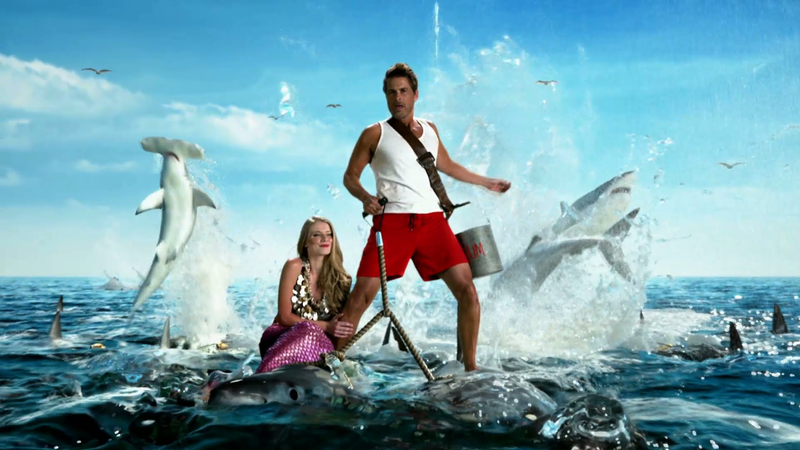 Top image via Rob Lowe’s 2014 Shark Week Promo. Cow photo credit: Liam Moloney | CC BY-SA 2.0.